Start planning your escape to Northern Indiana today. Please complete the form below and we’ll send you the requested information straight to your home. Be sure to fill out all of the necessary fields below. 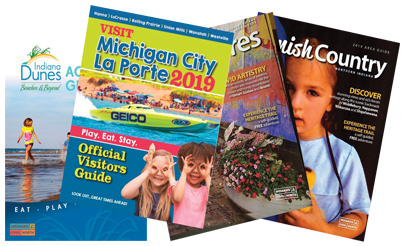 Which Brochures/visitor guides would you like to receive? Please note: Northern Indiana Tourism Development Commission will not disclose any personal information to any third party without written consent or unless authorized by law. Please see our Privacy Statement for more information.